"A Modern Day Tale About The Search For Love, Sanity, Ethel Merman And The Holy Grail." 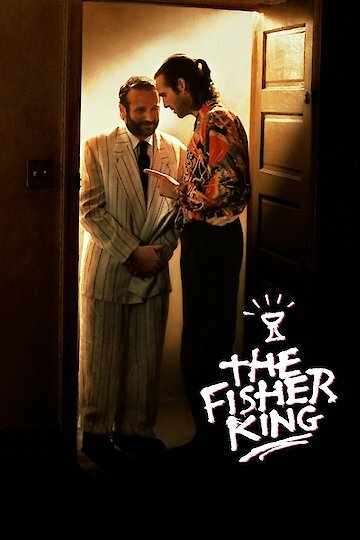 The Fisher King opens up with Jack Lucas, an arrogant and cynical talk radio host, who becomes a suicidal and despondent because of an incident where he insensitively responded to a depressed caller who then committed suicide on the Manhattan bridge after that. Jack attempts to commits suicide three years later. His attempts for suicide were foiled by a group of thugs. He was saved by a man name Parry, a homeless and deluded man who is in the search for the Holy Grail. Parry tries to persuade Jack to join him. Jack later agrees after knowing that Parry's condition was triggered by an incident where Parry witnessed his wife being murdered. Parry also sees this Red Knight who terrorizes him whenever he feels any confidence. Jack also finds out that after Parry had witnessed the whole incident, Parry went to a catatonic state, and remained as such for three years. After Parry came out of the state, he was then obsessed of the Fisher King Legend. The Fisher king was the one appointed by God to guard the Holy Grail. One day when the Fisher King was suffering, he was asked by a simple-minded Fool why that is so. The king merely replied that he was thirsty. The fool went on to give him water. The king realized the container was the Holy Grail he was looking for. He asked the fool where he found the cup. The fool merely replied, I don't know my king, I only knew you were thirsty. Jack seeing an opportunity to redeem him by helping Parry fined true love once more. Jack then sets up a Parry to a woman named Lydia, a shy accountant woman. Jack, and his girlfriend named Ann, joins the two for a dinner date. Parry then attempts to declare his love to Lydia. However, the Red Knight appears to torment him. He runs away from the situation, gets beaten by thugs and went back to a catatonic state again. The Fisher King is currently available to watch and stream, buy on demand at Amazon, Vudu, Google Play, FandangoNow, iTunes, YouTube VOD online.